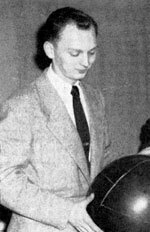 * Clifford R. Bohmbach died peacefully on November 17, 2016 at the age of 97. He is survived by his wife of 69 years, Winnie and three children. 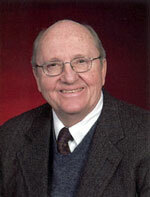 I left Northfield in 1956 and spent the remainder of my teaching and coaching career at St. Louis Park. I continue to work part time (at age 85) at the Lindberg Center at Hopkins High School as a supervisor. Maybe some year I will retire! Early Thanksgiving in Austin TX with son Brad. Making lefse is a family requirement of course. 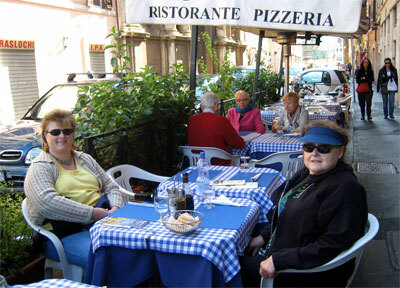 Pam and I in Rome lunching at a sidewalk cafe. 2015 - Nice and warm here in Texas, no winter to speak of, and all is well. Two more former neighbors have passed away this year, so sad. On a happier note, I am planning on attending the 2015 Reunion (see Calendar page for details) and also a cousin family reunion the same weekend plus the usual family that I left behind. Will be a busy weekend for sure. Hope to see you there. 2014 - Finally moved from MN to Texas in May. Been wanting to leave the cold north and see more sunshine and warm weather. Also appreciate a home without a basement, main floor laundry, spacious kitchen, walk in closets and trees galore in our cul-de-sac. Miss my former neighbors, two of which have passed away since moving here, and involvement in Roseville politics. Will see my daughter and her family a lot less but see my son more often. Time to move on. June 2012 - I have finally retired. No more budgets, audits or financial statements, thank you. It will be nice not to have to telecommute every morning and put out the latest something. Not sure what will come next but I won't be idle. Currently involved in local politics and that has been a time consuming effort. Expect to see you at the October luncheon. See the calendar for particulars. 2010 - I spent this November vacation with my son Brad in Austin TX. In addition to traveling around the Austin area and taking part in UT activities, we took time for an early Thanksgiving celebration which always begins with making lefse. Last November I took a memorable trip to Italy with daughter Pam. It was a workout walking the hills of Rome and getting down into the water taxi in Venice but we loved it. We also visited, Florence, Pisa and Siena. I, like many others, am still employed and liking it. I currently work part time as an Accountant / Financial Analyst for a technology firm in St Paul, MN. For the most part, I telecommute. I am active in investment and singles groups, spending most of my summer free time golfing, or trying to do so. I occasionally go golfing with my grandchildren and rarely with my daughter. Needless to say I am routinely out played and generally left in the dust. It is fun to see them succeed at this sport. I am also an avid photographer and digital imager and this consumes many hours. My daughter Pam, her husband and daughter live just North of my home. Pam is a Project Mgr. with an engineering firm in the Twin Cities, S-I-L Steve is a Rad. Tech with Abbott Hospital, while granddaughter is 18, will attend N. Dakota U this fall. My grandson is 21, has a 4 mo. old daughter and will be attending HVAC school next spring. My son Brad is a "computer network - commercial website - networking solutions consultant" living in Austin TX - he owns his own business. He is the one to thank for all the revisions to our website. Actually he totally re-built the back-end making my information and photo uploading a cinch. Many hours on his part to be sure. Recent years are busy with some remodeling of my home - going from dark woodwork to light, from vinyl tile to ceramic tile and from shears to soft blinds in the kitchen, new patio door and some windows. As we all know, this goes on forever. 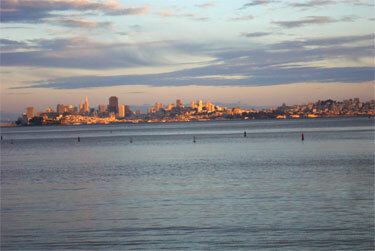 The housing market is still unpredictable here so will continue to live in the Twin Cities for at several more years. 2010 - See Sylvia's Bio under "Reunion Letters". Not long after Carlson and Longstreet handed us our diplomas, I entered UCLA, where writing for the DAILY BRUIN took up most of my free time, until financial need drove me to work full time and finish school one or two courses at a time. That took almost eight years, during which I found a challenging work with the California legislature. Politics were yeasty in that era, with the civil rights movement rising, the Vietnam War expanding. . . .
After an apprenticeship at the CBS radio station in Los Angeles, by 1971, I was in New York, the first female hired by CBS News to hit the road every day, turning out stories for the Evening News with Walter Cronkite. I started my own groundbreaking daytime newsmagazine program, contributed to “60 Minutes", and was a floor reporter at conventions. ABC News came calling when Roone Arledge took over both sports and news and I anchored ABC Weekend News and became a founding member of the anchor team at “20/20" . . . . In 1985, I made a move to “settle down", accepting an offer I could not refuse to anchor the news in San Francisco. But I found that investigative reporting and producing award-winning documentaries at KRON were more fulfilling than the daily work reading the news and enjoying the celebrity that comes with being a local anchor. 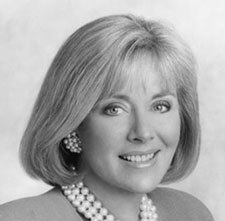 By 1990, I was a working correspondent again at ABC’s newsmagazines, “20/20" and “Primetime, finally retiring in 2001. Eagerly anticipating a permanent move to my weekend house on Long Island, I was packing up my apartment on the glorious autumn morning that Manhattan was attacked in the Twin Towers suicide raid. The quiet of my country life was interrupted a couple of years ago when “NOW with Bill Moyers (PBS)" called to ask me to go to Jefferson, Wisconsin to report on the meat packing strike there. I found a city, in age and disposition, not very different from Northfield, with the down-to-earth citizens, facing 21st century realities with resilience and dignity. There have been several other assignments for NOW, even after Bill’s retirement from the program last December. One (on Medicare, a subject I never thought I would live long enough to know so well!) was nominated for an Emmy, of which I actually already have five, as well as a number of other coveted trophies. Some mean more than others. I have two of the most coveted journalism prizes: a Peabody and a Dupont and I am proud to have been entered into the ranks of Distinguished Alumni of UCLA. But all this stuff and all those years comes down to this: I’m Sylvia Chase from Northfield, MN and in a ranking of thrills, chills and spills, not much beats hot cocoa after skating above the dam on the Cannon River or flying down Margaret Evans hill on the first snow of the year or walking hand in hand around Carleton Lakes on a warm spring night and when I have to stand up and give speeches, I’m still as nervous and scared as the first time Casey Hero told me to walk out on stage and play the part. 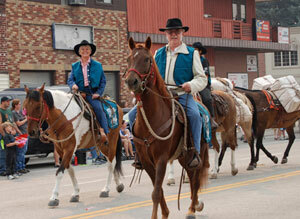 2007: We are living in rural Northfield and are retired but on the go. We vacationed in Branson recently. We have gardening, handyman chores and church activities that keep us busy. Our children's names are Rick, Dele and Darryl. I worked for G.T. Sheldahl Co in quality control from January 1960 – November 1967. I worked for General Electric from December 1967 – August 1981 in Louisville KY, Wilke Barre PA and Duluth MN. I was the supervisor of QA in contract and retail sales of major appliances. From then on to present day I work as an independent sales representative in welding alloys and industrial supplies in a five state area. I enjoy watching and following athletics – Gopher sports are my favorite. I will take up golf again though I find fishing easier at the supermarket these days and I don’t mind a casino once in a while. I will fully retire when I can no longer get around. Oh horror, horror, horror. From 2000: Well, my life certainly has changed! 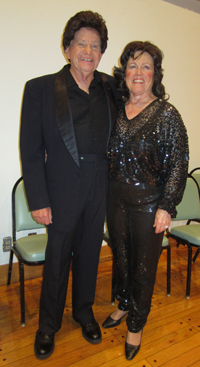 Don and I moved to Chicago in April 1996 in order for him to further his career as a jazz artist. In 1998 Don was granted custody of four of his minor children, who are now living with us – ages 9, 12, 15 and 17. It’s a zoo! I never would have guessed five years ago that I would be the mother of four more children and living in Chicago! After moving to Chicago, I worked as an editorial assistant for Pioneer Press Newspapers for almost three years I retired. Retirement is great, but as I’ve heard so many say before, “I’m busier that I’ve ever been! On Nov. 30, 2001, I became the grandmother of twins! -- a boy, Logan, and a girl, Audrey. (We call them the Minnesota twins) I now have a total of 3 grandchildren, which includes my granddaughter in New Jersey, Laura, age 13. Hobbies: Biking, Rosemaling, home decorating, flower gardening and movies. NW Montana Fair Parade - Fearless duo. Played percussion last year with the New Ulm City band as they did the 1812 overture for the city's 150th anniversary. I get to teach beginning or basic blacksmithing each year, and have now done a couple of metal sculptures that I could show off this summer. The last one is a full scale yellow lady slipper, but I don't have a good picture of it. The finer things never expected of me. I've included several pictures of our activities. We still buy a season pass to Welch Village ski area, we are just back from a trip to Big Mountain in Montana, and will ski Easter in Colorado. I still keep a small sailboat west of Faribault on French Lake. And I still work a couple of days a month to keep an oar in. We look forward to doing a pig roast this summer. Pat is already planning changes to the garden. The tent is ordered. Folks who wonder what I look like should browse the pictures of the last reunion and add five years of wear. 2008: Since the last reunion, little has changed. My activities are very much the same as they were. I do metalwork and teach blacksmithing to beginners. We dance quite a lot. We sail more than we did. Grand children are getting more important. 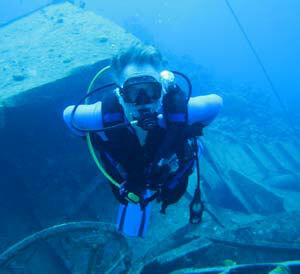 We scuba dive again. We missed three seasons of diving because of storms in the Caribbean, weddings, and my longstanding problem with malingering inertia. And we’ve started riding, western style. Pat has done this for some time, but Herb really had a problem with it. The fear is pretty much gone, I enjoy it, and now I now even have second thoughts about eating a horse. The lawn and garden will be ready. I can get a tree pruned to make room for a tent. If Bob comes up with another hog, I think we should spend part of a reunion right here at our place. If he doesn’t, I know a place that will sell me one and the suggestion is the same. Jon and I were one of the first ones married from our class. He joined the navy in Sept of 1955 and left for schools in Norman Okla and Olathe Kansas. He became a air controlman at Saufley Field in Pensacola, Florida. We were married in June of 56 and headed for Florida with our brand new 1956 Customline Ford hardtop (baby blue). Had no place to live and just winged it but eventually spent four summers there, (no air) and our two oldest sons were born there. Incidentally, we still have that car and has been used for our son's and grandson's weddings. Jon and I ended up farming, even though I said I would never marry one. I had no brothers, so I had already had enough of tractor work. Later,Jon went to work at Malt-O-Meal and while there, hauled the waste feed to our hogs. The last 15 years before retirement, he made a business of selling the feed to farmers. We had five sons and finally a little girl. Now we have 15 grandchildren and one great granddaughter. Our son, Mitchell, died at age 18 in a truck accident. Most live close by so we see them often. Jon has enjoyed being free to golf during retirement. He also plays tennis and took up reading books. (Ask to see his list of books he has read, all listed in alphabetical order by authors.) Most recently, he has taken up woodworking and already has made many pieces and cranks them out in no time. Need I mention that no cars get in our garage. There is always another saw to buy. I went to Vo Tech at age 47 because I had no experience in the job market. Guess what, after my degree they still wanted experience. Finally found work in an insurance office. Also took up the guitar at age 50 and now I play with a Blue Grass Band. Sewing has been a hobby of mine since high school, but now i make quilts and draperies instead of my own clothes. We have spent our winters in Florida for a number of years. This winter we will be saying put in Minnesota but will spend some time in Texas where our son lives. We look forward to the reunion and catching up with old friends. 2009: I volunteer at our Senior Clothes Closet every week and volunteer at church. We now have 14 grandchildren, youngest is 4 mos. They all live close to us. We hope to go to Arizona again this winter. The sun will feel good on my bad back. We still live on our farm north of Faribault, milking cows for 40 years. Thought we died and went to heaven when we freed ourselves of milking cows twice every day. We still raise crops and I am still working as an LPN for State of Minnesota. I love my job! We have 6 children and 13 grandchildren. We enjoy traveling. This winter we were in Nevada, Arizona and California. We are making our first trip to Mexico with some of our children and grandchildren. Hope we stay well!!! We both like antiques, movies, auctions, church activities, eating out (then Elaine doesn't have to cook) Look forward to seeing all of you again. Taken on a recent cruise. 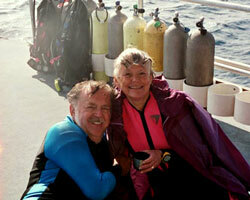 I am sending a brief bio and picture of Lorraine & me taken on a recent cruise. I spent 20 years as a pipefitter and in 1985 started Frame Mechanical as a heating, air-conditioning, and commercial refrigeration contractor in Minneapolis, MN. I lost my wife, Mary, to cancer in 1997 and married Lorraine Forslin in 1999. We purchased a condo iin Scottsdale, AZ in preparation for my retirement in 2002. We now spend six months in Scottsdale, AZ and six months in Minnetonka, MN. I enjoy playing golf in both AZ and MN with my brother, Chuck and Northfield friends. I am grateful for good health, family and the joys of retirement. 2014 - Dr. Freer passed away Sunday, August 17 at 92 years of age. 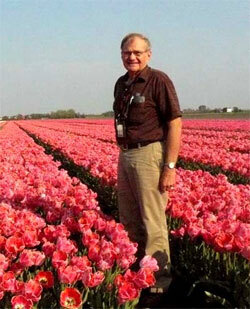 Memorial service at St John's Lutheran Church at 11 am, visitation one hour prior to the service. He will be remembered with fondness. Read his 50th Reunion letter to us, click on "Reunion Letters". I'll be pleased to attend the reunion and share the years past and present. I left NHS in 1962 to accept a position at St Olaf College, my alma mater. I had 12 good years at Northfield High School where my kids attended as well. 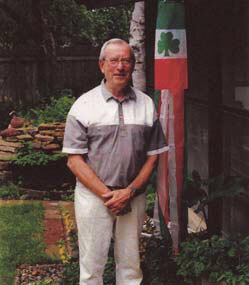 I retired from teaching in 1986 but continued with an Irish program I started at St Olaf until 1988. I have since taught a course in the Elder Collegium in Northfield, painted a lot and produced many construction collage box pieces which now number 650, scattered all over the country. My dear wife of 54 years died in 2001 and I finally sold my house and now live in a retirement apartment near St Olaf. At St Olaf I was director of English education, teacher of Irish program abroad and taught a wide range of English courses: language, literature and helped train nearly 600 student teachers of English. Teaching was good for me and I still teach adults Irish literature and short fiction of William Faulkner. Once a teacher always a teacher I suppose. Four sons and a daughter - I'm the old guy. 2010: Not much has changed for me. I still enjoy my retirement at our place on Lake Mille Lac's. We did a winter trip to the west coast and the South West this winter. 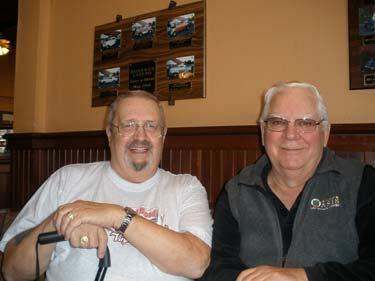 We had a nice visit with Bob Jenest in Reno on our way to San Francisco. This year we plan on spending most of this winter here at home. We had a family get together in June and had a picture taken of my brothers and sisters while we are all still above ground. We are all healthy but like the rest of us, older. We haven't been to Northfield for several years and we are looking forward to our visit at Herb's in September. I don't do FaceBook as I spend most of my computer time with emails. So, I apologize to those who have tried to contact me by Face Book. My wife, Linda, is a big fan of Face book and has a large following and updates me on anything of interest. One of my current hobbies is pistol shooting, reloading and casting bullets. This keeps my costs down and keeps me busy some days. Fishing is great this year, the walleye bite is on and there is a lot action out on the lake. See you in Sept. I retired about 3-4 years ago from working at a Financial Company in St Paul for about 18 years and moved to Brainerd. We have a RV lot on Lake Mille Lacs and spend most weekends relaxing and looking for walleyes. A little bored with retired life, I started a Mortgage Broker Business and have been busy doing residential mortgages in Minnesota and Nevada. It's fun and I have a good time providing low rates and closing costs and making new friends. We go to Las Vegas in November and return to Brainerd in late March. I even find time from eating, gambling and visiting the locals to working my Minnesota and Nevada mortgage business. It's really amazing what you can do with the internet, cell phones, fax machines and computer systems that are available today. Previous to the financial world I owned a Silo Company for about 15 years in Cannon Falls. Before that, I worked for a steel company in Chicago as a sales representative and traveled about half of the US. When I got out of the Army with a tour in Germany, I worked for a contractor in Minneapolis doing work in most of the down town buildings. Any how, a short story of my life. My health is good and hope to continue enjoying the coming years with my wife Linda and our extended family. Just a short up date. Linda and I are spending the winter at Lake Havasu, Az. 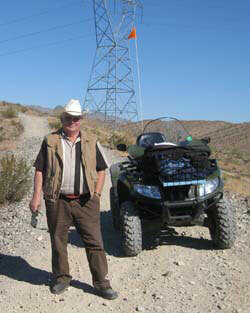 We do quite a bit of 4 wheeling checking out many desert trails, mines and lost canyons. 2006: We left Minnesota 1st part of Oct and spent a couple of weeks at Kalispell, Mt, visiting my daughters's new home. We worked our way down to Lake Havasu and decided to spend the winter here with some friends. Plan on being back in Minnesota the 1st part of April. 2015 - Bev and I again built a 10 foot diameter igloo this past winter. I say it is built for our grandkids to play and sleep in. Bev says it is built to amuse the builder who graduated from high school 60 years ago. We still enjoy bicycling. In May (2015) we hope to do a seven- day bike tour in Croatia. The retired math teacher has cut back on his one hour math tutoring sessions. I enjoy the student contact but there were too many days on which I would have my first student at 3:30 and, with a half hour sandwich break, go straight through to 10:00 with back- to- back one hour sessions. I decided I did not need that anymore and asked the High School office to no longer give out my name. I still let a few sneak through. We invest a good part of our time and energy on our 10-acre family campsite in southeast Minnesota. The camp includes a grove of oak trees, “His”and “Hers” showers, a gazebo with seating for 40, a concrete and steel building that makes a good retreat in case of threatening weather. It has made a cozy site for just that purpose on a couple occasions. We host family groups and various church groups during the summer. The Geffert family may not win many awards for diverse employment. My working career has been spent as a math teacher. I taught 3 years at Spring Valley HS, 35 years at Chaska HS with 31 years as math department chair, and 1 year in Orbost, Australia as an exchange fellow (awesome year). We revisited our Aussie friends a year ago. Following retirement at Chaska I have spent one year at Minneapolis Roosevelt HS (a fun and rewarding cultural experience), one quarter at Eden Prairie HS for a teacher on leave and eight weeks at Chaska for a teacher on leave. My wife Bev is a retired HS history teacher. Both our kids watched Bev and me doing school work, evenings at home and assured us they would never be teachers (ha). Our daughter Jill graduated from Carleton and became an English teacher at Edina HS. 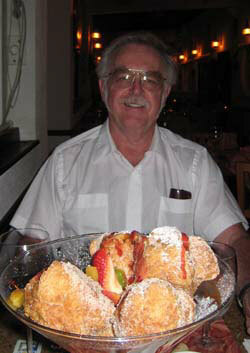 Jill’s husband Vic is Principal Research Scientist at Honeywell and teaches night classes at Augsburg. Our son Bryn graduated from St Olaf, went on to obtain a PhD in Russian history at the U of M and is Director of Libraries at St Olaf, also teaching some Russian history there. Byrn’s wife teaches in a Spanish immersion program in Northfield. Bryn and Jill each have one child. Our hobbies include bicycling, BWCA camping, building igloos, X-C skiing & snowshoeing. We enjoy trips on our tandem bicycle from home to Missouri, Door County WI, or wherever the road leads. Since retiring we have don bike tours in Germany and Ireland along with shorter bike outings in England, Greece, Norway, Australia and New Zealand. I am looking forward to the July get-together. My Dad John Gibson dressed in his "Jesse James" outfit. He was a member of the Chamber of Commerce that organized the first Jesse James Days in Northfield. He was born and raised in nearby Waterford. 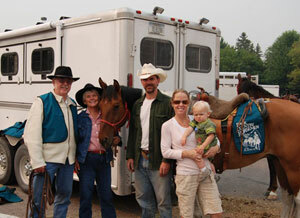 2013 - We are doing some fishing at our trailer up north and carting grandkids to swimming and weight training. My husband is busy gardening and hoping for a good crop of tomatoes to make V8 juice. Last year we made about 60+ quarts and ran out this week. Greet everyone from me. 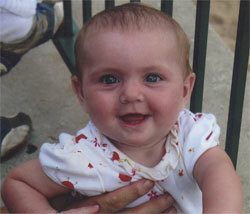 2009 update: Dylan (grandson) is now10 1/2 and we also have a granddaughter, Kaitlyn Jo, who is 4 years old. I keep busy taking Katie to pre-school two days a week and keeping up with my mother who is 95 and going strong. I am hoping to get to the reunion in 2010. 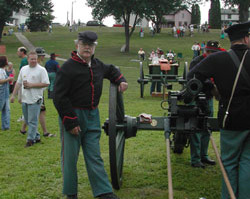 My dad, John Gibson, was one of the organizers of the first Jesse James Days in Northfield. He also took part in the first bank raid during Jesse James Days and I still have a picture of him in his "gangster" getup. Even though I didn't graduate from Northfield (having left after my sophomore year) I still recognize faces in the 2005 reunion and remember great times in high school. We spend a lot of time in the summer at our trailer fishing. After graduating from Augsburg College, I worked as a physical education teacher in Wis. and Minn. and California. I had a minor in business ed and finished a major and went to teaching business education in Wisconsin. Stan Labs and I were married in 1965 in Menomonie, Wisconsin and have two children, Sonia (Teacher in Minnetonka) and Beth (Dean of Education at Chippewa Valley Tech). Both followed in Mom's footsteps I guess. I left teaching for a while and worked in a law office and as a secretary at UW-Stout. I went back to teaching business and computers at Chippewa Valley Tech in 1986. Retired in 1996 to enjoy life. My husband Stan farmed and worked at 3M in Menomonie. He has retired too and we spend a lot of time up at the lake north of Amery. I keep busy at church and making baby quilts for baptisms, reading, fishing in the summer, and doing crossword puzzles. We live on a farm but rent out the land and don't have any animals anymore. Well, here it is, May 2008, and life keeps zooming by. In many respects, things have not changed much since our last reunion in 2005. I’m still the wandering widower out trying to have some fun in the sun. At this point in life, it’s the best medicine. About the only real changes are that my dad passed away last year at 94, and I’ve had to put my mother, who is now 94, into a nursing home because of failing health. That has been a bit of a struggle. As I had mentioned before in a prior comment, when my boys had grown into manhood they managed to migrate from the Washington, DC area to Colorado and call it home. 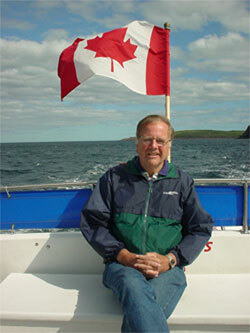 Once, on a trip out for a visit, my oldest son Eric said, “I don’t think we are ever going to move back east, dad”. Having raised them on the hiking, biking, skiing and the great outdoors bit it was no big surprise. With that, I knew where I was going to retire. So far, it has been a fun experience. I also found that if you are going to enjoy retirement, you have to work at it. It’s really a job just like any other. As a result, I manage to keep active these days by belonging to about ten different clubs and organizations around town, which includes three ski clubs. Winter is definitely a fun time for the boys and me. Joining these organizations has been a great way to get to know people out here. One of the clubs, The Breakfast Club, which a couple of friends and I started about three years ago, has now grown to over 230 members and is still growing. It is becoming a major problem as of late on finding places big enough for once a month breakfast (we do other things as well). As a result we have started limiting it to about 120 people. In June, we are having our annual picnic in the park breakfast where the guys do all the cooking. Between the organizations and my kids, life keeps me busy. I still do a lot of hiking, biking, skiing and lousy golf as well as doing things with my kids. I also find myself helping them out with homegrown projects when the opportunity arises. Wildlife out here has also been fascinating for me. On several occasions during the winter months, I’ve seen herds of as many as 200 antelope (Pronghorns) and over a 100 Elk grazing along the roadsides in the mountains. It is not unusual to see smaller groups of them during the spring and summer months as well. 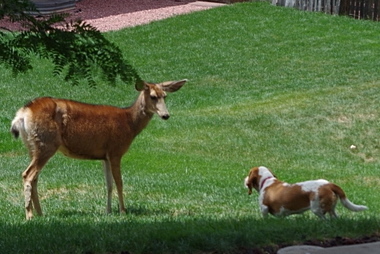 Deer, fox and coyotes are to be seen all over town and bears with some frequency. Mountain lions show up occasionally. Mountain goats and long horn sheep are also to be seen in the mountains if you know where to look. This fall, I’m looking foreword to going to an annual Elk rutting in Rocky Mountain National Park for several days in September with friends – will take pictures. As some of you may know, photography has also been one of my hobbies. Recently I have be doing some traveling exploring a few of our National Park out here as well as other nooks, crannies and back roads. I’ve also tried to take some photos along the way. I know a couple of people who have been fortunate to see several dozen of these places; however, I have a long way to go. If you aren’t one of them too, you might enjoy going to www.daveharmer.myphotoalbum.com and see some of the countryside I’ve traveled through. I have established three albums so far that cover a few parts of the west and some of its back roads less traveled and at some point plan to add more. Like a lot of photographers, I’m not happy with a couple of the pictures, and would like to go back and do some reshooting. I hope to do a little of that this summer as well as check out some new places. I keep trying to improve my technique for whatever value that may serve. 2016 - I retired about ten years ago, from what once the Schilling spice company. I worked there for twenty eight years, after a total of nine in the Army. I spent a year tour in Vietnam and ended up with a Purple Heart, Bronze Star, and Air Medal. I now have a three and twelve year old for grandkids, which I love. I broke the chin-up record in H.S. by doing 18, and I can still do that many. Younger guys at the gym say I'm an inspiration for them, so always makes me feel good to hear that. I think a lot of it had to do with working hard on the farm when I was a kid. 2010 - Unfortunately, now l try to never go anywhere where my strength will be compromised. In the last year, my arthritis has been a huge "Pain", and I work on nutritional, and alternative solutions to it, having no real faith in doctors as such. I do, however continue to sell most of my Antique Show inventory, and I have a house full of elegant antiques and decorative objects. My specialties are Paintings, Tiffany Lamps, Oriental Rugs, Jewelry, Art Glass, and, "Guess What", The Fifties! Meanwhile my son, Steve, married a horsewoman 4 1/2 years ago. She had 45 miniature horses now they have most of the horses, although the horse business has gone the way of other investments, plus Black Angus Cattle, pigs and chickens. There are also a bunch of duplexes to monitor. He is doing well! And he has a soon to be 4 year old son. 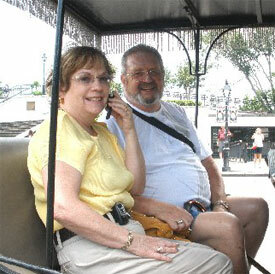 My daughter, Carolyn, lost her husband to lung cancer about three years ago. She was inconsolable for so long but now has a new man in her life and is now somewhat content. Her daughters are still in difficult stages so she is not without craziness in her life. I still have dogs, but only two, after years of many more -- Teddy Bear and Max. They are the children in my life! I will be with you in spirit at the Reunion! Have fun! Hello from Springdale, Arkansas - after only 50 years! I left, after graduation, on the Great Northern train, for Glacier Park, for a summer as a chamber maid, and I met quite a few Minnesota college students who would become life-long friends. Meanwhile, my son, Steve, was becoming a Champion Moto-Cross racer. Carolyn had become a Speed Skater, with the Little Rock team, and I was taking flying lessons, and eventually logged in close to 300 hours, flying to the Southern Decorative Arts Seminars, and elsewhere to visit relatives. Our lives went in different directions and we divorced in 1983. It was terrible. I set to doing the Antique Shows, full-time, from Miami to Kansas City. My kids were older then; they stayed at home and looked after the house and dogs. People were looking to me for my information, knowledge, and expertise in this field. I did this for 16 more years, until I began to get arthritic knees (and van) and I decided to pull in my wings. But, I must say, the old adage, "Choose a job you love and you will never work another day in your life is true. I don't know who I might have been, if not the collector, buyer and seller of lovely things. By that time, the Internet was of age, and EBay was the big new marketplace, I jumped in and spent a year looking. buying, and learning to run a computer. Finally, five years ago, got in as a seller and now my life is one of EBay and the Post Office. I continue to do priced estate sales and appraisals, if I get called. What I have learned is not to rule out anything in your experience. Look, touch, and experience, try, pray, ask God for guidance, listen, and you will be taken care of – somehow. And, if you can take care of a few others on the path, that will be a plus. My life has been 23 years with the man I married, and 23 years afterwards, It has been very interesting, I think, although quieter now. My four dogs love me, and my two kids, and two grandchildren, come over when they can. And, I do welcome visitors. 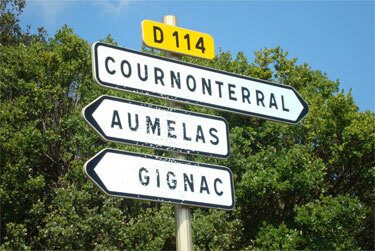 Call or E-Mail if you find yourself coming this way. I am single and have five children and eight grandchildren. I enjoy hiking, climbing basketball, attending ball games, and sightseeing in the mountains. I will be in Northfield for all three days of the All-School Reunion. Hope to see many people and classmates. Charlie Weed visited in June 2010. 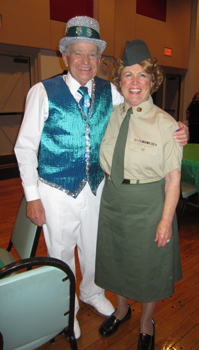 2010 - I enjoyed seeing the 50th and 55th reunion pictures. I'm sorry that I can't be there for all the good times. Charlie Weed stopped by here in Reno for a few days in June. We had a lot of laughs recalling a lot of things I had long forgotten. If anyone is in Reno for any reason, give me a call. Maybe we can get together. You couldn't find me in the graduation list from 1955 because I was in my "rebellious age" at that time of my life. I dropped out of school and joined the Navy at the tender age of 17 when I thought I knew everything. While in the Navy I got my G.E.D. for High School and 1 year of college. After getting out of the Navy I went to Pasadena City College for a year. I realized then that I wanted to pursue a career in Law Enforcement. The Navy had made a cop out of me and I wanted to go back to that in civilian life. I started for Los Angeles County in January of 1962 after working in sales in Southern California where I met my first wife. I transferred out to Riverside County in 1971 where I met my current wife. We have 1 son and 2 grandchildren. I retired medically from Riverside County Sheriff in 1982. We moved to Nevada where I worked as a security shift supervisor at the Peppermill Hotel/Casino in Reno. We moved to Las Vegas where I worked in casinos and private security for a gated community. I had a stroke and after recovering from that we moved back to the Reno area in an area north of the city called Cold Springs. We are now contemplating a move to CoeurD'Alene, Idaho. Reno is getting to be too big and congested. We went to Northfield in the summer of 2006. It had been 50 years since I had been there. I used to live across the street from Don Klinefelter and Ivan Geffert. I remember a few names from those days such as Jerry Garlie, Larry Turner and Bryce Skaar. We couldn't find them or anyone else I used to know. Perhaps someone else will send me e-mails and we can live the old days all over again. After graduating from high school I attended St. Olaf College for two years, a half year at U. of Minnesota and finished with a degree in education from Mankato State University. After teaching math and physics for two years in Faribeault I went to Berlin, Germany to teach math and physics for the Department of Defense schools. There, I also coached football, basketball and soccer. Shortly before I arrived in Berlin, the Communist regime in East Germany erected a wall around West Berlin. And there it remained until 1989. In Berlin I met my wife, Nancy, who was teaching in the DOD elementary school. We were married in Berlin and stayed in Germany for five years. On returning to the states, I took on a math position in a high school in Glen Ellyn, Illinois. I completed my masters degree at Illinois Institute of Technology in Chicago. I then went on to the University of Illinois in Champaign for doctoral work. After about seven years of teaching, I went into high school administration. I retired seven years ago and still live in the area. I have four children and eight grandchildren, all living within fifteen miles of where I live. Nick & I are both enjoying retirement [in Los Angeles, CA]. We especially enjoy babysitting our 20 month old grandson. Our plan is to down size, move from our current house to our smaller home next door. Our son & daughter are both married. They work & live within 30 miles of us. Our travel plans for the next year include visiting Nick's relatives in Bulgaria. We'll be at the all school reunion. (Jorge passed away January 25, 2017 at age 91) Happy 50th to the class of 1955! Looking forward to joining you to celebrate another NHS milestone. It’s always great to renew acquaintances with former students. Joann and I have had that pleasure for the class of “51 to ’54 from NHS and many homecomings of the classes of ’58 to ’87 at Carleton College where I returned to teach after a year of graduate school following 55-56 at NHS. When people ask what I miss most after 40 years of teaching, my answer is always “the students"! Not the lesson preparation, not the committee meetings, or the test grading, but the young people who kept me on my toes, up to date, and feeling young myself throughout my career. So thank to all of you for the three good years we had together at NHS! We have kept our home in Northfield during retirement to continue to spend time with our longtime friends and to enjoy the many wonderful activities Northfield and its schools and colleges have to offer. We also spend wonderful summers at our lake place near Grand Rapids. Incidentlly we just returned from a wonderful trip to Greece, celebrating our 50th wedding anniversary with our family. 2010 - Greetings All! Can it already be time for our 55th? Perhaps it seems so soon because I was on the Planning Committee for our NHS 50th, and shortly thereafter, for my Carleton 50th (June 2009). I am looking forward to just relaxing and enjoying classmates’ company this time around. During the past five years, I’ve undergone a brief but serious bout of depression related to retirement (according to my “shrink”! ), traveled a good bit throughout the U.S., and continued doing substantial work in biomedical ethics as a member of the local teaching hospital’s Ethics Committee and co-chair of its Institutional Review Board. I’m assistant for pastoral visitation to the ill and homebound for our Congregational UCC church. (I knew my seminary training would come in handy someday!) I also swim regularly at the ‘Y’ in an attempt to ward off senior dementia as long as possible! Chattanooga, particularly Signal Mountain, seems to be a good retirement choice for Liz and me, especially given the milder winters, though we continue to return to Minnesota twice a year to visit relatives. I plan to spend some time in the reunion tent at Herb’s Friday and Saturday afternoons and look forward to visiting with anyone interested in chatting. GO RAIDERS! My bio will be brief because my life, pre- and post-NHS, has been pretty traditional (a child of the '50s?!). I continued my education “across the street" (literally) at Carleton ('59) and then did graduate work at Chicago Theological Seminary ('63) and the University of Chicago ('67). Carleton made all the difference for me, especially the study of philosophy, and NHS and the many teachers who cared made it all possible -- thank you! I married Liz Erickson, an Ole, in '63 and we have two adopted daughters, Sara (born in '67) and Anna ('69), who now have families of their own and live in Nashville and Charlotte, NC, respectively. We’ve been blessed with three lovely grandchildren. Professionally, I've taught religion and philosophy at Lawrence University (Appleton, WI), at the University of the South (Sewanee, TN), and, for thirty-five years, at the University of Tennessee at Chattanooga from which I retired in June 2003. Liz continues her work as director of publications at a private school, Girls Preparatory School. I am really looking forward to our 50th reunion (and Northfield's 150th!) and hope we have a record turnout. "Y'all come"!! Greetings from Signal Mtn. TN! I'm sorry that I will miss the luncheon on Oct. 14, 2011 but Liz and I will be in Grand Rapids, MN, preparing for my niece's wedding on Saturday. However, I do want to pass on my impressions of a recent look at good old NHS. As some of you know, our building has been purchased and refurbished by Carleton as the Weitz Center for Creativity, i.e. a fancy fine arts/ humanities building. I was there last weekend as a new member of the Carleton Alumni Council and was very impressed. The architects have saved much of the old building (1911) and kept the old wooden doors with their original numbers, the bleacher seats as covers for the pillar supports, and the backs and seats of our old auditorium chairs as quasi ceiling fans, but actual light covers. In short, it's well worth a visit! I believe it's open from 8 a.m. to 9 p.m. most days and the building is community friendly. Hope you all have a chance to see it. 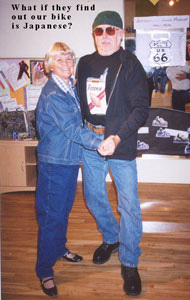 Our 25th Anniversary Party - All our childen and grand children attended this event in 2004. I spent most of my working years in the automotive service business. I was involved in all phases – repairs to management. I also served 23 years in the Army, Army National Guard and Army Reserve in enlisted and officer capacities. I made many friends and met many wonderful people both on my job and in the military. I was activated six times in the National Guard, mostly for flood control and once for riot control on Plymouth Ave in Minneapolis. Interesting times! Over the years I was active in Boy Scouts as Cub Master, civic organizations, church organizations and was a Township Supervisor for 11 years. I have two sons from my first marriage who now live in Colorado. I married Clarice in 1979. We just celebrated our 25th anniversary! She has two children that live in Eagan MN. 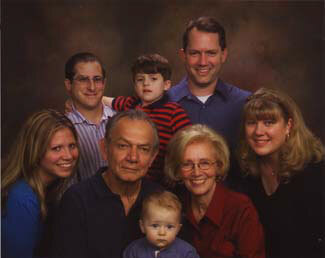 We share the four children and their 7 grandchildren, which includes two sets of twins that are 10 and 2 years old. We really enjoy being around them all. One of my goals was to live in the country and farm. After 25 years (1986), we purchased a 21 acre hobby farm and enjoyed it for 18 years. My legs were giving out so we moved to town to a 2 bedroom home in SE Northfield. I think I will miss the farm. We enjoy winter trips to Arizona and summer trips up North. Most of all we enjoy the freedom of retirement like playing cards with friends on a moments notice. Looking forward to seeing everyone in July. I am enjoying retirement very much and doing a bit of part time work with computers which is really more fun than work. My wife Debbie plans to retire from full time work this Fall and just work part time. Our daughter Jennifer (29), had an interesting trip to the Amazon a couple of years ago through the Chicago Teachers Center at Northeastern Illinois University. She is still teaching Middle School Science for the Chicago Public Schools and taking drama classes which she enjoys a lot. She has 4 children Nathan (9), Nicky (7), and the twins Natalie and Noah (6) who are a great joy. Our daughter Jeannette graduated from University of Illinois Chicago with a joint degree in English and Antropology and is doing tutoring in the Chicago Public Schools. She plans to go on to grad school in the Fall to get a graduate degree in teaching. Get Together Summer 2006: Al Malecha, Ken Mracek, Chico Krenik, George Mach & Fred Malecha. Back Row: Cathy Malecha, Bonnie Dupay, Clarice Krenik, Carol Mach & Jean Malecha. 2013 - I am still doing the trucking so nothing new with us. Glad to be able to still work and like what I do. 2010 - George & I are still trucking from MN, IA to CA and back to MN. We now consider ourselves semi-retired as the freight situation for us is a little slower going to Ca than it was a few years ago. So as a result we have a bit more time in MN, which is good in the summer and NOT so good in the winter. We have had a chance to spend a bit more time with kids and grandkids so that's been a nice plus also. We have no real plans to retire unless one of us can't pass the driving physical or the freight gets so bad as to be non-existent for us. We are planning on being at the reunion this year so will look forward to that. After high-school I joined the Navy and served aboard carriers, USS Forestal, USS Roosevelt, and USS Randolph. I was a plane captain on an experimental squadron. After the military I was employed by NSP (XCEL now) as a lineman in Faribault and Northfield. I married my wife Cathy in 1960. We have 7 children – 6 daughters and one son. I suffered a brain aneurysm in 1973 and was put on medical disability by NSP. I have since had a triple A aneurysm and another arterial aneurysm. I have two more which are watched regularly by the Mayo Clinic (I am lucky to be here, they say). We moved to Pequot Lakes in 1978 to run a grocery store, which we later turned into rental property. Cathy has been active in the community. She was instrumental in starting a Historical Society and Library for the city of Pequot. She keeps me involved with these two projects. She is currently serving her second term as the Mayor of Pequot Lakes. My title is Head of Security and the “First Man". We are busy with 13 grandchildren (7 boys and 6 girls). We enjoy being with family and close friends. We do some camping and take small trips. I enjoy being at home the best. 2007: Al suffered a stroke in January and currently resides at the Bethany Nursing Home in Brainerd, MN. I have lived on the home farm since birth. 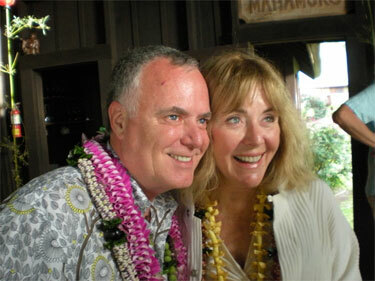 My wife, Jane and I will be married for 45 years on May 3, '05. After attending Vo-Tech in Faribault, studying Accounting, I sold the dairy herd in 1988. I worked doing accounting for an attorney till March, 1999. After that I went to work for Cenneidigh, Inc., a company that has group homes for developmentally disabled people, and, also does outreach help to clients able to live alone, however need help with things that we take for granted, such as shopping, banking, etc. I work mainly with accounts payable, however help with the office where needed. I work 4 days per week, having Fridays off. I love both my job and the long weekends. We have six children and eleven grandchildren, from 18 years to 3 months of age. One daughter and family lives near Milwaukee, WI. Otherwise, all the rest live within 30 miles of us. Two sons and families built homes on part of our farm. Love having them so close. Jane has been a crafter (doll clothes for Barbie, American Girl and Bitty Baby) for 15 years and does part time house cleaning for others. We enjoy our family, traveling, and taking care of the homestead, however the land is rented to our neighbor. I am also involved with our Catholic Church, serving as lector, Eucharistic Minister and am part of our church choir. I try to live each day to the fullest, enjoying each day God gives me. 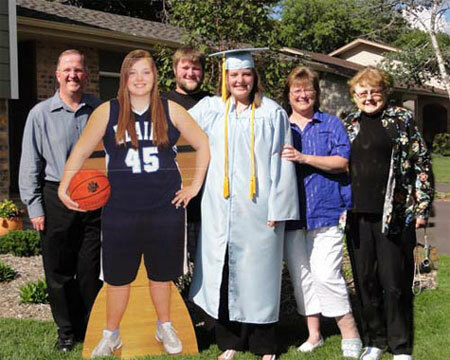 I have two daughters and three grandchildren – my 15 year old granddaughter is six feet tall. I graduated from North Mankato Technical College and the University of Minnesota. I was employed in the hospitality industry owning a full service restaurant in the Maryland Hotel in Minneapolis and was awarded executive chef certification. I also worked on court cases in Minnesota, Missouri, the Federal system and even the Supreme court. I was a judge for the State courts of common law in Missouiri and Arkansas . This month I graduated from the University of Missouri in Historic Preservation and Electrical Engineering. I am looking forward to seeing everyone. After High School I farmed with my mother. In 1974 I started a woodworking business doing mostly custom cabinets. I sold my woodworking business in 2001. I retired from farming in 1999 after planting 43 crops. We are very lucky to be able to live in a fertile land area. In 1958 I married Loretta Foley and we had four daughters, Kin, Kori, Karla and Karroll. I have five grandchildren all involved in sports so I am attending a lot of ball games. I lost my wife Loretta in a pedestrian accident. I winter in Lake Havasu City, AZ. Enjoy fishing, do some golfing (duffer) and some traveling. I am presently serving on the Board of Directors for Steele Waseca Co-op Electric. 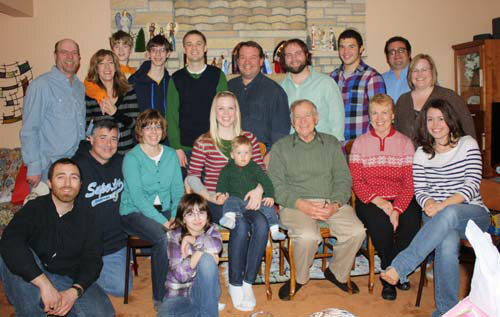 We have four children and nine grandchildren all living in the Twin City area so we get to see them on a regular basis. We have an RV and we go to Arizona for a couple of months in the winter. In the summer we like to do camping trips with the family. I do a lot of gardening and grow and dry flowers for floral arrangements. The goal, from Junior High and on, was always a career in architecture; and to that end, I kept going to school after June, 1955: St. Olaf, Berkeley, Univ. of Minnesota..... until 12/63. That was followed by an 'apprenticeship' at the [then] SM&M offices in Northfield; a great time, working with good people, in a wide variety of projects and passing my architectural registration exams. Also, between 1/64 and 8/67, I married my first wife - Jean; we adopted two children [subsequently, we have produce one more child - by more traditional means]. As Martha Stewart would say..... those  months were 'life altering'. In 1967 I was lured by the academic life; we moved to Menomonie, Wisconsin and I began 31 years of teaching in the Univ. of Wisconsin System - at Stout. I continued to practice architecture, working part-time for established architectural and engineering firms in the region. I retired from full-time teaching in 1998; but, continue a modest architectural practice, for a few long-standing clients, to this day. We built a little-shingle-cottage-in-the-woods in 1968; it's been our 'permanent residence' ever since. c.1988 we started spending more and more of our summers on the North Shore - in the Grand Marais area; we now spend close to five months each summer on 'da shor'. Occasionally, we'll spend a little wintertime in Tucson. I'm still married to my first wife; the family has grown beyond three children to include five grandchildren [all age five and under]. I am very grateful that this little family has not, yet, had to deal with debilitating illness, catastrophic accident[s] or death; it is so easy for it to be otherwise. The future?? Would like to keep working; take more train trips; build one more house: the 'Geezerhaus'; and [contrary to my doctor's advice] keep buying green bananas. What I have done in the last 50 years: After high school graduation, I went to St. Olaf for one year, Cornell College in Mt. Vernon, IA for one and one half years and then Winona State College for two and one half years. I graduated with a BS in Elementary Education with a Library Science minor. I taught kindergarten in Elgin, IL for four years. Then I went to Oxon Hill, MD for one year plus taking graduate credits at the University of Maryland. Then I went to Eugene, OR to work in the Public Library. In December 1965 I went to Kodiak, Alaska to visit a friend from elementary school and met a very nice young man, whom I married. He was in the U. S. Navy so we went to San Diego, CA following the wedding. Following those years we went to Blair Nebraska, his home town, and went on to live in Iowa and S. Dakota. In 1973 we adopted five children under the age of six so I had my own class. In 1983 he left and the kids and I were in California Junction, Iowa. Since then I have moved to Yankton, SD and work part time in an art gallery. 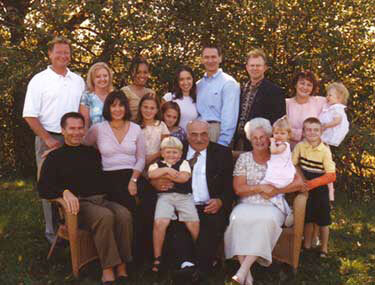 We have seventeen grandchildren (ages 18-6) and our own children are ages 31-38. The four girls live in Nebraska and S. Dakota and our son lives in Missouri. My hobbies are gardening, cooking and grandchildren. I am learning about art (all kinds) and more about music. The years have gone by fast and were very interesting! Never a dull moment! It has been 25 years since I last attended a class reunion. I only attended NHS up to the end of my sophomore year and would have graduated from NHS had we not moved away to Maine. I loved Northfield and of course my friends. I have kept in touch with several of them for the past 52 years, namely Sonja, Carol Knudson, Sylvia and Phyllis & Jon. The last reunion I attended was by myself and this time for the 50th I am coming with my husband Phil. I met Phil when I was attending Elmira College and we eloped the summe after my junior year. Phil and I have been married for 46 years and have three married children and six grand children. Phil was a PGA touring player and a golf club professional and I worked as a legal secretary. We are now both enjoying retirement and are very busy with golf, pool (Phil), knitting reading and bridge club (me), and trying to keep up with our grand children. I am so looking forward to seeing all of the class of '55. I am still a “Midwesterner" in my heart; those Northfield years were major growing-up years for me. I had plans to go into the nursing field. I even had my tuition paid at the U of M. However, my mom became ill and my sister was in the hospital so I postponed my plans. Then I met a man who would become my husband and became a wife and mother. Four girls and two boys: Robin, Wanita, Dan, Tim, Shelly and Chris. I have 19 grandchildren, 2 step grandchildren and 8 great grand children. I have had many jobs: waitress, fry coordinator, sewing, toy and box factory worker, nursing assistant and now I am a personal care attendant to a handicapped child. 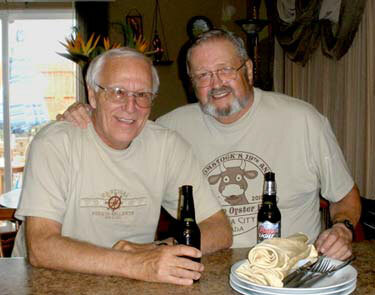 My husband Ralph was a truck driver and we were married for 43 years when he died of Cancer. One horrible long year I took care of him where he couldn’t eat drink or speak. Last year I had a bout with the big “C". Now I am Cancer free. I enjoy many hobbies. Sewing, knitting, crocheting, sketching, cooking, gardening, computer and even video games. I was involved with Girl Scouts for 20 years, until last year. Hope to see old friends. 2010 - Well, I hear it is time for another reunion. YEA! Gosh, it seems like a long time since last time and to get reacquainted with friends I never thought I would ever go a day without talking to. I seem to have come a long ways since graduation. They have been great years. I have been blessed with four children and their families. Most of us live close enough to visit each other on a fairly often schedule but not as often as I wish we could. My daughter is a captain in the Navy. She has two daughters and lives in D.C. My three sons all live in Washington State and are involved in education. Now for me—all my life I have had great health. I have been widowed for the past six years. I have traveled a lot and am making plans now for a trip to Thailand to visit my middle son and his wife. (They will be living there on a 2-year teaching program.) This past year I was diagnosed with Alzheimer’s disease. So I told my kids I had better be their first visitor. This is as close to a Christmas letter as I will get so don’t be surprised to read it at Christmas, also. I live in the faith that God is walking beside me and when He will take me to Heaven. In the mean time I thank God daily for the blessings He has given me and I look forward to the life to come in heaven. God bless you all. • I am giving a brief review of just the high lights of my years since graduation. I was married the summer of my junior year in college and started our family the next year so I didn’t get my degree until my youngest child was ready for school. It was a blessing for me that I had waited since I got to stay home with my children when they were young. My career was in the field of education. I taught elementary school for the next 22 years. I was a primary teacher and loved every minute of it. I did branch out into high school athletics and coached tennis for the last ten years. I have to brag a bit in that both of my boys and girls teams were first in state competition. I retired early from teaching when my husband had a massive heart failure. Since he was a salesman and found it impossible to sit at home, we decided to have me go along with him. This was a great solution. We had thirteen more years than we had been told we could expect. We had several wonderful trips to Europe and Italy. We also got to every part of the US and many places in Canada. My husband died last year so this has been a real learning year for me. Fortunately my children have been a great help and comfort to me. I have three sons and one daughter. They all have families and are gainfully employed and I am so grateful for them. The Lord has given me a very full life. Jim and I just celebrated our 50th wedding anniversary. Boy, 50 years ago I caused a stir, getting married while still in high school was a big “No-No". My how times have changed. We have enjoyed a good life, some good and bad trials along the way. The worst was four years ago with the death of our son Steve at age 43. We had seven children. Two are gone, one dying at birth. Our biggest joy is our family and spending time at our lake cabin with them. We have ten grand children and one great grand daughter. I am still working with the Sadexdo Company in Faribo Jefferson school. Carol has asked us all to write a short bio about ourselves to put on the class web-site. She has done an outstanding job over the last fifteen years keeping us informed about our fellow classmates. So, it is about time that I redo mine and I hope all of you take a little time write about what is happening in your life right now. I guess what has kept me busy the last month or so is getting our 55th reunion letters out to you. Hope you all have received yours by now. With the help of Chico, Carol and Karna, I think we have good addresses for just about everyone. 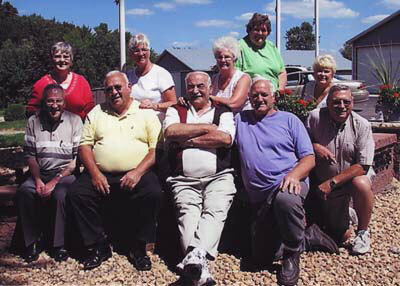 Hope you are planning to come to the reunion in Northfield on September 10 – 12, 2010. It should be great fun. Sara and I have been blessed with good health over the years. 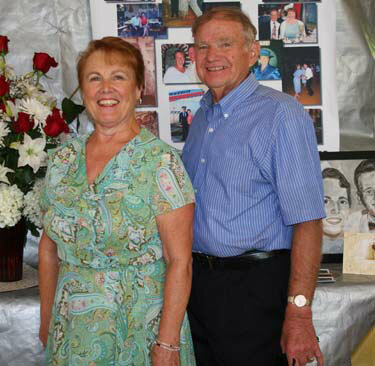 We celebrated our 50th wedding anniversary in July with an open house at our home on Roberds Lake near Faribault. In August, we took the whole family (eighteen of us) to the Wisconsin Dells for a week. In March next year we will become great grandparent for the first time. I have been retired for 17 years already and it just does not seem possible. I keep busy by being very active in two service clubs, at our church, with yard work, a little golf and of course I spend some time on the computer. We spend three and half mouths in Arizona during the winter. We also love to travel all over the world. Our last trip was to Ireland for a couple of weeks. 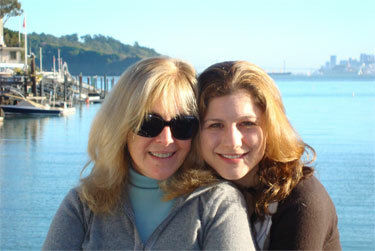 2012: Sara and I once again (17 years +) starred in the ‘Happy Trails Annual Review’ as we winter in Arizona. We performed a number of routines in various costumes and had a blast as some 300 were entertained. We played Donny and Marie, sung as ‘Rat Pack’ members, I performed as a Chippendale to name a few - along with 55+ other entertainers. two daughters are married and we have two wonderful sons-in-laws and a grandson. We enjoy watching our grandson play hockey and baseball. 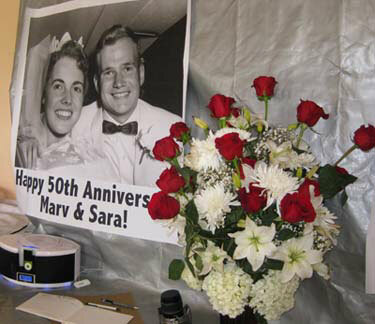 This past year we celebrated our 50th wedding anniversary! Can't believe how fast the years have gone. We also have 2 new additions to our family. Two great-grandsons, ages 2-1/2 mos. and 2 years. They keep us young and moving. Vick Swanson (Dottie) I have been living in Northfield all my life except for a two year hitch in the army. I retired from NSP in 1995 after 31-1/2 years of service. I've been married to Dorothy for 48 years this October. We have a daughter who is married and lives in North Branch with one daughter. We have a son who is married and lives in Blaine who has two daughters and a son. The last ten winters we have been going to Florida for 10-12 weeks to get out of the cold winters. My hobbires are hunting, fishing, golfing, working on the house, family and grand children. Born in Owatonna, raised in Northfield, leaving after St. Olaf in 1959. Enjoyed a full career in the fields of human resources, compensation and employee benefits. I worked first for the US Dept. of Labor, Bureau of Labor Statistics, U S Army and then 34 years for Sundstrand Corporation, now part of United Technologies. Retired in July, 2000 but continued with some consulting, particularly in health and retirement related benefit areas for several years. Interestingly, I once felt I was knowledgeable enough of the health insurance “system” to fix it. 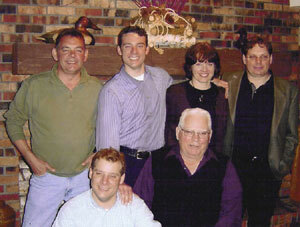 At the time of our 2005 reunion I had just been diagnosed with Myeloma, a bone marrow cancer. It was a year before any treatment was required and that turned out to be through a clinical trial. The drug used is modified Thalidomide, called Revlamlid, and it really worked. While not cured I have thankfully been virtually symptom and treatment free since then. The experience inspired me to volunteer as a driver for the American Cancer Society. I continue to have fond memories of all the Northfield years. In the summer of 2008 my sister and brothers and spouses had a chance to spend a morning in Northfield. We visited the old house, walked through the downtown and both colleges. If you have not seen the Carleton Japanese Garden it is worth a stop. Small but nicely done, it is in the vicinity of Margaret Evans sledding hill and behind a relatively new dorm. My wife Sue, a Chicago area native, and I met in 1966, married in 1968 and have lived in the Rockford, Illinois area since that time. We have two children, Scott, Irene, Marie (14) and Ethan (8) in Port Washington, Wisconsin and Sandra and Mike in Atlanta, Georgia. Scott and Ethan are Bears fans in Packer land and Mike is a close follower of all U of Virginia sports. Sue and I really enjoy spending time with the kids. Sandra works for Delta so standby flying makes those Atlanta trips almost as convenient as the drive to Port Washington. I retired from St. Olaf in summer 2002 and shortly thereafter took a part time job--very part time, work only on Fridays to take the place of the office manager of a small company in Rosemount. I enjoy the work. Before that taught high school business education for 8 years, did substitute teaching for 7 years (long enough to qualify for combat duty), worked part time as bank employee for 5 years and worked as an administrative assistant at St. Olaf for 13 years. But I consider my most important job raising 4 fine sons. If some of you thought at times I had my head in the clouds during our school days, I might have been daydreaming about horses. Horses were my first passion. I had my first horse "Frosty" at age 8 and since have had many happy memories of caring for, trail riding, showing and racing different horse friends. In the last 10 years I have had total knee replacement of both knees and do not now own a horse, but because of my horse interest, I was asked to write a short book about the history of the work horse in Minnesota agriculture for the Minnesota Agricultural Interpretive Center of Waseca. This was sold at their horse expo in 2003. My husband John retired from livestock but still crop farms. We live on a century farm in Randolph, 10 miles from Northfield and enjoy traveling. My hobbies/interests are biking, swimming, gardening, bridge, reading, church committees and activities, and leading an interdenominational Bible study. I notice Bob Warner commented in his bio he likes history (so do I) and thinks the human condition hasn't changed much. I love the Bible because even though it was written during a much different time and culture, it still meets our human needs and touches hearts. It renews our faith, encourages, instructs and gives assurance of salvation. I'm looking forward to seeing you all at our 50th! 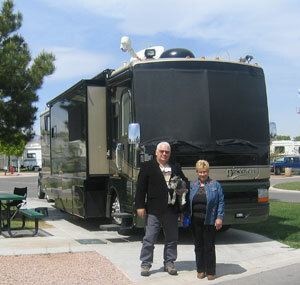 2010 - Like many retirees we've done some traveling, mainly throughout the southwest, west coast and western Canada. 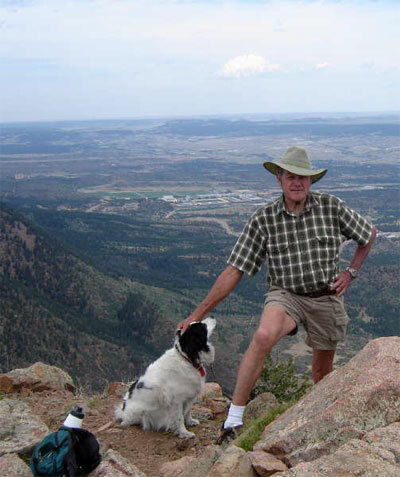 On one trip we stopped in Colorado Springs to see Gene Hackensen (NHS-54) and his wife. On another, Leonard Malecha (NHS-54) and his wife came up and spent time with us in the Houston area. We enjoyed the time spent with both. Several years ago we toured eastern Europe. While in Prague we arranged for a car and English speaking driver to take us around southern Bohemia to see the towns and villages from which my great-grandparents emigrated in the 19th century. Size wise I would say these communities ranged from the size of Castle Rock to Lonsdale. Family wise: Two sons have married, one divorced. Two great-granddaughters have been added, making three 'greats' for me. But, it seems with gains there are losses and my daughter lost her battle with cancer three years ago this summer. Karen and I are still busy. I just looked at the July calendar and there were only five days that we didn't have something going. August is already two-thirds booked. I don't know how we ever had time to hold jobs. We especially enjoy the summer concerts in the park that many communities in the area sponsor (I wonder if this interest dates back to the summer band concerts we were in all those years ago). We sometimes take in 2-3 a week. So, to generalize, after almost fifteen years, retired life is still good. 2005 - I guess one could say I had 2 parallel careers (three if parenting five kids counts). I started my first career about a month after we graduated. I joined the Northfield unit of the Minn. National Guard. In 1984 I retired with 28 years active and reserve service. A little over a year was spent with the Northfield unit followed by four years in the USAF as a radar mechanic on F-100's. After moving back to California in 1963 I once again enlisted in the Army Guard where I eventually became a tank commander. That first year we participated in "Operation Desert Strike", the largest military desert exercise since Patton trained there during WWII (roughly a quarter of a million combat troops plus support activities). The next year I spent most of my summer camp on street patrol during the Watts riots. When my time was up with the Army Guard I enlisted in the Air Guard where I served almost eighteen years. I started in warehouse operations, then went into training and the last few years I was the "Education Services" NCOIC. My real job was with Southern Counties which then merged into Southern California Gas Co. Here I started in the Construction Department digging trenches to lay in gas piping. Then on to meter reading for six years while I went back to school. After graduating from Cal State Fullerton I joined the Internal Audit Staff where I got to work on Interstate Supply projects (including one to bring down gas from the north pole - it never made the financial cut) in addition to the routine stuff. I still remember seeing my first million dollar check during a bank reconciliation. After that several more years in various accounting functions. In 1984 I went over to the Regulatory Department where I spent six years as a Rate Design Analyst. My last position was in the Gas Supply Department where I contracted to buy natural gas from the California production facilities of Chevron, Mobil, Texaco, Shell, Exxon, etc., etc. until I retired at the beginning of 1996. Then for almost six more years I contracted back part-time in this same job. I finally really retired in August of 2001 and have enjoyed every day of not having a job since then. Now I putter in our yard. We have a half acre of fruit and other trees, hedges, rose bushes and assorted plants I sometimes don't recognize. I can walk out any time and see something that needs to be taken care of - sometimes I do it and sometimes I just turn around and settle in with a good book. Following graduation I entered the Navy and from 1955-58 spent most of my time aboard ship overseas. From 1959-61 I worked at various jobs until I started work for the City of Northfield in 1962 and worked for them for thirty three years. I married Ardis Steinberg that same year and we are still enjoying life together. I joined the Fire Dept Rescue Squad and served over twenty five years. I planned to retire but my wife objected. I started consulting work for an engineering firm and worked for the City of Northfield. I completely retired last year and am active as a volunteer for local veterans organizations. I am chairman of the group working on a Veterans Memorial Park. It is scheduled for completion in November. We have three children Brian, Jay and Cindy. Brian has two girls, Jay has three boys and Cindy living in a large wooded area in Inver Grove Heights has many cats, dogs and “children". We also have two lovely daughters-in-law. I intend to find more time to fish and travel soon. Lawrence Valek (Dolores) 2015 - We still live in our woods west of Northfield and spend winters in Tucson, AZ traveling in our motorhome. We visit a son in Dallas, TX and a daughter in Colorado as often as possible. I'm usually found working in my shop on various projects made from my supply of lumber. We now have 20 grandchildren and will have 9 great-grandchildren by October. We enjoy cousin's lunches every month and breakfasts with brothers and sisters. We have many dear friends both here and in Tucson. Life is great. My wife Dolores and I will be married 47 years on May 3. We farmed and raised seven children just west of I-35 near Hazelwood. In 1998 we sold a part of our farm and built a new home on Hwy 19, west of Northfield. After retiring from farming, we owned a couple of businesses. I served as Rice County Commissioner for 16 years and am currently on the Webster Town Board. We have 16 grandchildren and 5 great grandchildren. 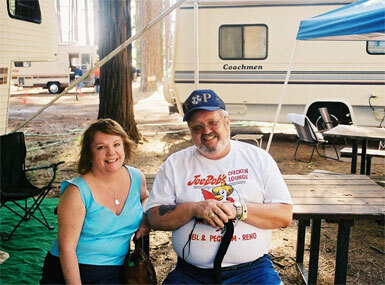 We have owned a motor home since the 1970’s when we traveled with our children. Nowit’s just the two of us and the motorhome is twice as big. We spend part of the winter in Tucson, AZ and spend time with our son, Tim and family in TX and son Jeff and family in GA. We have driven to Alaska twice and traveled much of the u.S. We have been to Hawaii three times and would love to go back again. I built a 40 X 70 shop in which I do woodworking. I enjoy building furniture for our children and grandchildren and recently have completed several projects at Annunciation church. Retirement is great and we look forward to taking many more trips in the RV. 1991, Kamchatka, Russia. Picture for son of village chief and flowers for the "ami" hunter. 2010 - Life after NHS started at Carleton with a BA in economics, nine letters in football, wrestling, track and work not only studying some but also plenty of waiting on tables and sorting mail in the post office. Attending night school at the U of M resulted in a MBA. Later did additional work in finance at Harvard and in management at Stanford. Carleton led to my marriage to Barbara and three children and six grandchildren ages ten to twenty. We divorced 1980 and in 1985 I married Deborah, adopted her three children, and divorced her in 1997. Having learned, I have been single since and living in Scottsdale in the winter and Minnetonka in the summer. My first full time job was with Mobil Oil in their Management Training. They paid for the U and then made me the Area Manager in Chicago. This led to National Automotive Sales Manager at Graco, VP Marketing and Sales at Marquette Corp., Group VP Automotive at Applied Power Corp., President Bishman/Royal and Group VP at Royal Industries, Group VP Automotive and Industrial Group at Lear Siegler Inc., President and CEO of Xerxes Corp., President and CEO of Containment Technologies Corp., President and CEO of EnviroScrub Technologies, and finally retirement in 2007. Board seats with four companies still exist but they will end next year. Travel has been and still is a serious activity. My jobs helped me to see 98 countries. Hunting is a passion that has taken me on multiple safaris in Africa, hunts in Mongolia, Russia, China and nearly anywhere else that big game was hunted the last forty-five years. Physical activity was always attractive starting with captaining the Minnesota Rugby Union ( at the time the one and only team in MN--consisting of mostly old football players), competitive judo and a teaching belt. Handball led to racquetball and tennis with Midwest rankings in the two. Golf is now the last activity with both knees replaceable and a shoulder beyond medical help. My blessings have been more than abundant and luck has always been plentiful. God has been good to me. I thank the Lord. Robert Vosejpka (Dianne) I have farmed full-time before and since graduation and still farm at this point. I enjoy planting and watching plants grow. I divorced in 1987 and got remarried to Diane in 1993. We have 5 grown children between the two of us and have 4 grand children. At age 49 I started playing softball and volleyball. I still play open volleyball (my favorite sport) throughout the school year, once a week. In the summer I play church league softball. I also enjoy fishing. My wife and I enjoy dining out on Saturday nights. We go on trips at least once a year since we married. Our largest trip was to Medjugore, Bosnia, which was excellent. We will probably do this one again. We experienced seeing a miracle happening there. Duluth is another vacation area we enjoy almost yearly. I’ve been a lifelong farmer and lived on the same farm for 45 years. Farming has always given me a challenge and is very motivating. It keeps mind and body active and is very rewarding. I hope to continue for some time. Hope we have a good turnout of classmates in early July. I am single and have two children, Mathew & Maria, five grandchildren Zachary, Derek, Natalie, Claire and Eric. My hobbies are Golfing and reading about history. Everything about the human condition really hasn’t changed much. Trivia: Who won the World Series in 1955?